Endogenous digoxin, a steroidal glycoside which functions as a membrane sodium potassium ATPase inhibitor has also been related to its etiology due to the intracellular magnesium deficiency it produces. Endogenous digoxin has been related to the pathogenesis of acquired immunodeficiency syndrome. The possibility of endogenous digoxin synthesis by actinide based primitive organism like archaea with a mevalonate pathway and cholesterol catabolism was considered. The concept of a shadow biosphere of organisms with alternate biochemistry present in earth itself has been put forward by serveral groups. 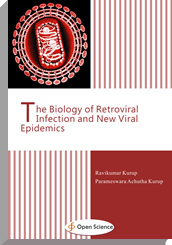 The actinide dependent shadow biosphere of endosymbiotic archaea and viroids plays a role in the genesis of retroviral infection and new viral epidemics.